My people have been in New England visiting extended family at the beach, eating fried clams, playing tennis, and attending cousin Julianna's wedding. I stayed behind to take care of the goats, which is something to think about before you get goats. Believe me, I've thought about it a lot these last few days. I gave away Natalie's babies yesterday and the new owner put the in dog crates in the back of his pick-up and you could hear them bleating piteously even after they'd disappeared from view. Traumatic. For me, but mostly for Natalie, who has been looking for them and crying ever since. She is crying as I type. It is sad and in the middle of the night it is also irritating. I don't think there's anything to do but keep her milked and wait it out. In addition to milking, during the absence of the family I've been trying to accomplish writing projects, work projects, hydrangea planting, tree removals, window washing, sewing machine set-up, Moonrise Kingdom. Cooking wasn't on that list and I've subsisted on cantaloupe, grilled cheese sandwiches, Father's Day chocolates, and Gummi vitamins. Blogging wasn't on that list either. Clearly. 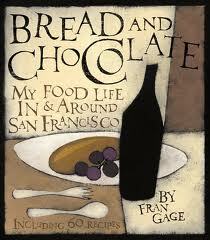 I bought Fran Gage's book Bread and Chocolate right when it came out about a decade ago. I read it cover to cover and remember thinking it was a sweet and gentle remembrance of a happy life in San Francisco that revolved around food. She writes a chapter about the greenmarket a few blocks fom where I used to live, and Citizen Cake where I used to buy cookies. I know the places and the vendors she describes and I feel a connection to this book because it captures a world I know, not because she tells me anything I didn't know. The recipes were solid. The breads most solid of all. I made the rye bread for oysters, the polenta bread, the fougasse and (repeatedly) the country wheat bread. They were all great. Given that Gage is a baker, I was a little disappointed that the dessert recipes weren't more consistently unusual and delicious. A lot of them seemed like boilerplate: chocolate poundcake, lemon poundcake, shortbread cookies, chocolate pots de creme. They were fine, but neither exceptionally good nor unique, which is what I expect from the recipes in a food memoir. I expect a grab bag of highly personal, hand-picked, outstanding recipes I won't find anywhere else. There were a few of these (peanut butter and jelly cake), but in my view, not enough. UPDATE: In recounting to list the "good and great" recipes (see below) I discovered that I made an error in my initial tally. I must have miscounted, because I only made 28 recipes from the book. Guys, I'm slipping. I would buy this book again, but it's not a shelf essential. My husband comes home tonight and I'll probably start cooking again tomorrow, though it is tempting to continue with the grilled cheese. Kids are staying in New England for a while; Isabel won't be home until August. As requested, here is a list of the recipes that I deemed either "good" or "great:" strawberry ice cream, vanilla bean shortbread, brioches with goat cheese custard, potato salad with sake and olive oil, penne with saffron cream sauce, mushroom appetizer puffs, roast chicken with mushrooms, plum preserves, fougasse, red pepper and olive oil sauce, watercress salad with apples and pecans, salade beaujolaise, ricotta gnocchi, rye bread to serve with oysters, polenta bread, fusilli with escarole, country wheat bread, potatoes baked in parchment, chocolate pots de creme, fresh apple salsa. Bon appetit! I vote for taking a break from cooking. I think if you don't have to cook, it is great to wait for inspiration once in a while. Eventually, some recipe, food, or thought process gets the juices flowing. Since your husband doesn't care, take a break! Summer is such a great time to eat simply. Umm, I selfishly vote to keep cooking. You said you've already picked out the next cookbook, so I can't wait to hear! Let's try this again, Just the two of you? Throw some wonderful things on the grill, eat the leftovers, go out to dinner and be thankful you are getting rid of those dangerous Oaks! Oaks? DANGEROUS oaks? How so? I am sad for Natalie. I recently went through the exact same thing, but with kittens. Feral Mama Cat had kittens (I keep wanting to say she "laid" kittens, as if they were eggs) under my deck, and I finally gave the last two away last weekend. She has been howling for them for a week. Piteously. The very saddest part was when I had the last kitten in the house, having flea-bathed it in preparation for foisting on some tender-hearted stranger, and Mama Cat saw her kitten through the window, and the two of them pawed at the window, one on each side, trying to get to each other. Sadness. I suppose this is too much to ask, but it would sure be great if in your summations, you named the great recipes and the really good ones? Thanks. MANY thanks for the listing of the good and great recipes, a fabulous addition to your wonderful blog. Now I hope your time permits you to jump back in to another book! Love it! I really love this wonderful, and inspiring book by Fran Gage, who used to own a bakery in my neighborhood. Not just a collection of stories, but interspersed with the prose are recipes culled from her experiences and travels. To me, this is what a cookbook should really be. It's a lovely book--well worth owning.